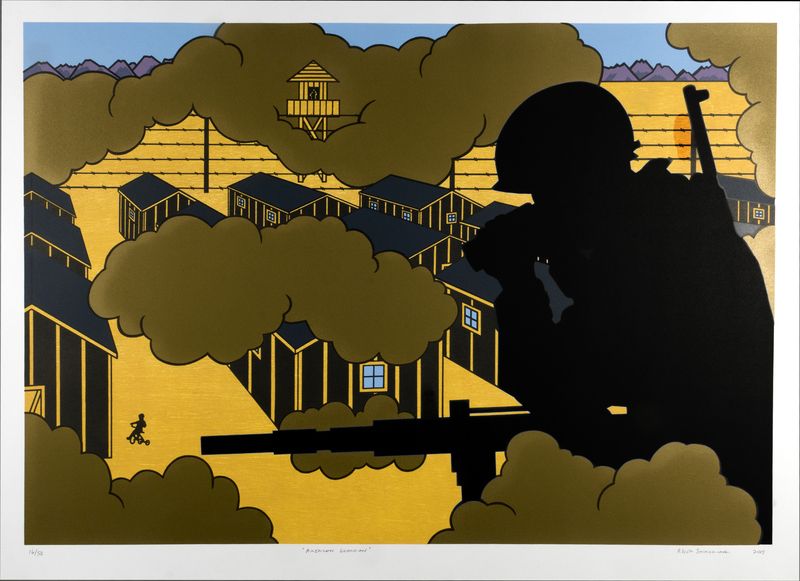 A third-generation Japanese American, Roger Shimomura was born in Seattle, Washington and has resided in Kansas since 1969 where he holds the position of Distinguished Professor Emeritus in Fine Art at the University of Kansas in Lawrence. Shimomura’s work in printmaking, painting, and performance art addresses the contradictions and prejudices that frequently characterize America’s cultural diversity. Blending American Pop Art influences with 18th- and 19th-century Japanese woodcut traditions, Shimomura explores both the humor and tragedy that are part of his Asian-American identity. recollections, Shimomura produced a haunting series of paintings and prints that reflect his upbringing in wartime internment camps in Washington State and Idaho, a period that lasted more than three years. In a composition that suggests the serene “pictures of the floating world” of Ukiyo-e prints, Shimomura contrasts the innocence of childhood with the harsh realities of an anxious world. The lithograph’s palette of drab military colors combines with the unmistakable symbols of high-security imprisonment to instill in viewers a vicarious experience of the hardships such families endured.